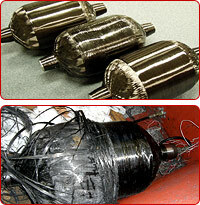 Starting with the development of a metallic-fire extinguisher in collaboration with the Japan Nuclear Cycle Development Institute in 2000, Maruhachi is working on the research & development and practical applications of CFRP (carbon fiber reinforced composite material) high-pressure containers. 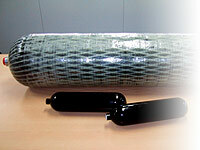 By utilizing various technologies and techniques accumulated in the research & development of CFRP high-pressure containers, such as structural analysis simulation, filament winding (FW) forming process, and performance evaluation systems, and promoting deeper collaboration with associated universities, research institutes, and companies, we are working on research & development themes based on various market needs. Maruhachi devoted itself to the development of CFRP medical oxygen containers, and repeatedly conducted various inspections for design and performance demonstration, and acquired a domestic manufacturing license from the High Pressure Gas Safety Institute of Japan in 2003. A CFRP high-pressure hydrogen container for use in fuel-cell vehicles was adopted as a Consortium R&D Project for Regional Revitalization from METI Kansai in 2005 and 2006, and then research & development of a 70mpa-class plastic high-pressure container for use in fuel-cell vehicles was begun. Copyright(C) 2006 Maruhachi Co.,Ltd. All Rights Reserved.